Affordable Handyman 101, LLC. Residential and commercial repairs. Why pay more for the same work? Want to connect with Greg? 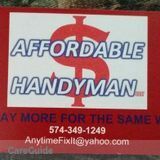 Insured Affordable Handyman to do residential repairs and landscaping including tree and limb removal. My recent jobs have included installing doors, tubs, sinks, cut down trees, fixed fences and laid flooring. There are only a few things around a house I don't do, ie. carpets and roofs even though I just did a roof for an old woman on a budget. I also do commercial repairs such as grills, deep fryers, air conditioners and coolers. Ice machine cleaning. Recent jobs have been completed at Red Dog Saloon and Foot Locker in the Markland Mall. I am a single father with custody of my 4 year old daughter and running a business to meet our needs, so every job I take on is important to me. Let us make your project a reality. We are a remodeling company with a high focus of providing quality work and satisfaction.